You've got that right. Batwoman is a torture test. I'm reminded of the old joke: "This film needs something... perhaps burial at sea." Jerry Warren shamelessly pads the running time with footage taken from The Mole People directed by Virgil Vogel. For some reason, he took another Vogel film, Terror in the Midnight Sun and butchered it by cutting scenes, adding extra footage of his own and releasing it as Invasion of the Animal People. 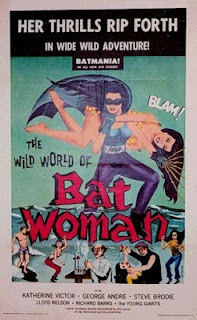 When it was still too short to sell to TV, he padded it further with footage starring the actress who played Batwoman, Katherine Victor. The attempts at humor are what make Batwoman unbearable. Maybe they should have spent a few bucks to hire William Dozier, the Batman narrator, to record a voiceover for this film. It couldn't have hurt.